We've heard the rumors. We've seen the fan art. But now we can confirm that Mark Hamill will be sporting a fantastic, Jedi Master-appropriate beard when he reprises his role as Luke Skywalker in Star Wars: Episode VII, and he looks completely awesome with it. Note the beard is bigger, bushier and — well, Obi-Wan-ier — than the trim facial hair he was sporting last month when Disney released that photo of Hamill hanging out with Mickey Mouse. If some of the plot rumors are true, and Luke is a reclusive hermit much like his master was in A New Hope, this beard certainly sets the mood. 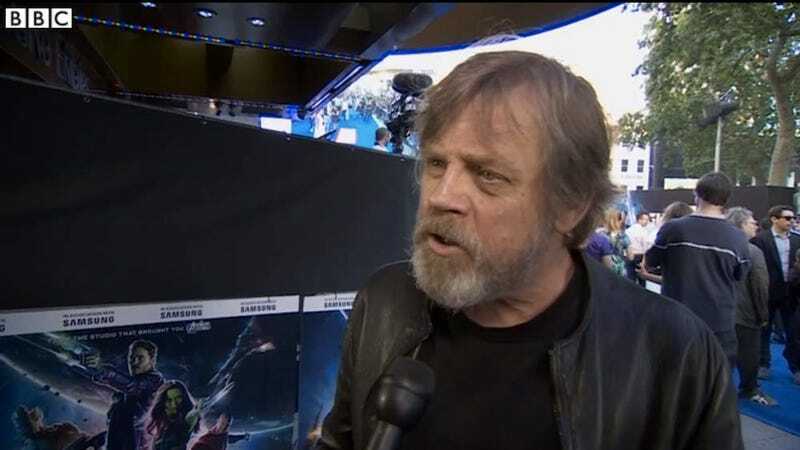 Hamill and his whiskers appeared at the UK premiere of Guardians of the Galaxy, where he told the BBC that he was there "to lend his support and grow a 'contractually-obligated beard'." As reporter Lizo Mzimba notes, Hamill is right in the middle of filming Episode VII, so this is most likely exactly what he's packing on-screen. Again, it seems very Jedi Master-y to me. Anyone disagree?